It took six years and cost over 800million pounds to build. 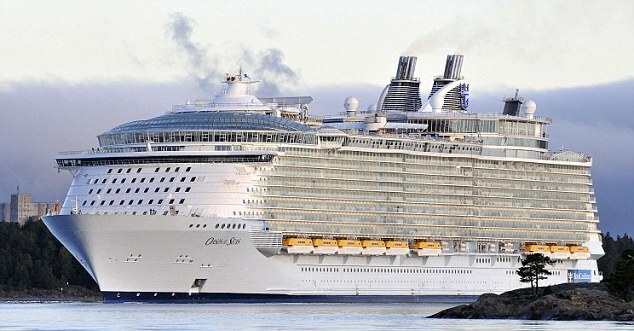 And now the Oasis of the Seas will finally be launched into the ocean with the maiden voyage set for December. The ship was handed over to the Royal Caribbean cruiseline in the Finnish port of Turku by shipbuilder STX on Wednesday this week. It measures a staggering 16 decks high, or 65 metres (213 feet) above the waterline, and measures 1,180ft long and 154 ft wide and has the capacity to accommodate 6,360 passengers and 2,160 crew members. Guests who spend time aboard the record breaking vessel can expect a whole new world of entertainment including an aquatic amphitheater - called the Aqua Theatre - which serves as a pool by day and a dazzling ocean front theatre by night and a rock climbing area. 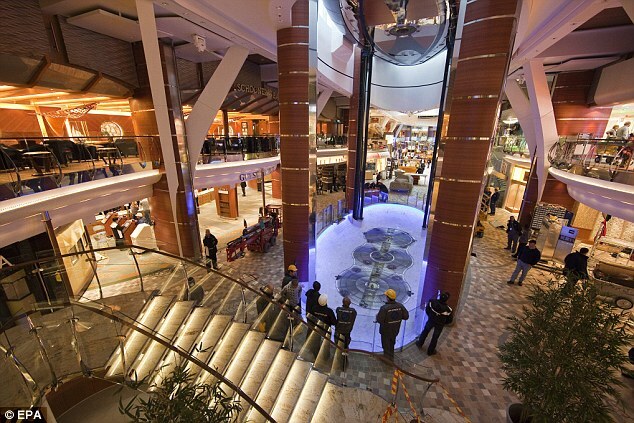 Included in the ship's vast expanse are seven themed 'neighbourhoods': Central Park, Boardwalk, the Royal Promenade, Pool and Sports Zone, Vitality at Sea Spa and Fitness Centre, Entertainment Place and Youth Zone. Each of which includes extraordinary elements such as the first park at sea, a zip line that races diagonally nine-decks above an open-air atrium, an original handcrafted carousel and 28 multilevel urban-style loft suites boasting floor-to-ceiling windows. Richard Fain, the chief executive of Royal Caribbean, told reporters the new ship had attracted strong pre-bookings despite the global financial crisis and said the aim was to lure new customers who have not cruised before. There are however still spots left for the ship's maiden voyage in December. 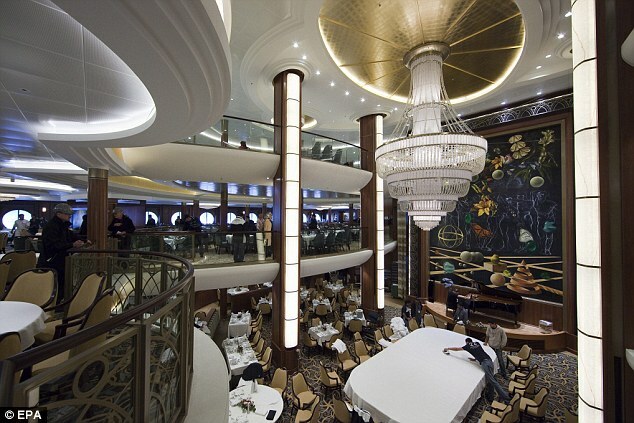 'Part of the thought process of the ship is to overcome the old myths people have about cruising. It's very hard to look at a vessel like this and think that cruising is secondary when you can choose rock-climbing, surfing or zip-lining,' Fain explained. 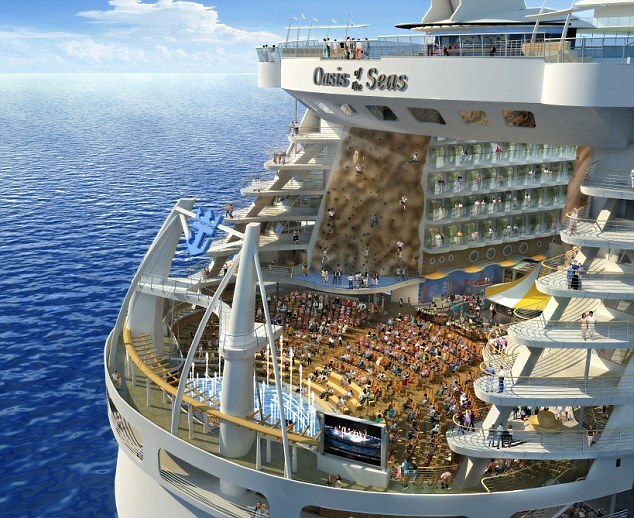 The Oasis of the Seas, which will be sailing mainly in the sunny Caribbean, catering to younger, more active passengers with children offering a wider selection of activities, including 21 swimming pools, an aqua park, a carousel and a science lab. Hundreds of builders and cleaners were still putting the final touches on the ship on Wednesday, installing carpets and cleaning the surfaces of the ship, docked at the Turku shipyard some 100 miles northwest of Helsinki. 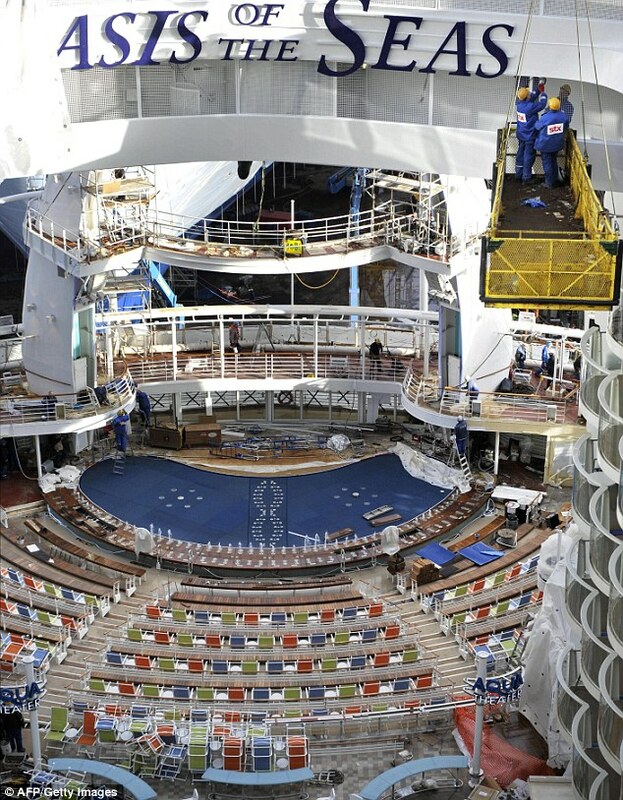 Although the shipyard employees are still busy working on Oasis of the Seas and its sister ship Allure of the Seas, which is to be ready in autumn 2010, Fain and Landtman admitted the global downturn had drained cruising companies' willingness to order new vessels. 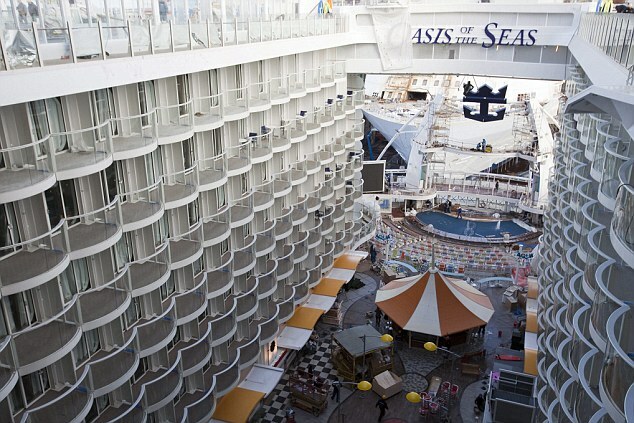 On Wednesday evening, some 1,000 VIP guests will be dining and partying on board the Oasis of the Seas, but details about the guest list have not been disclosed. The vessel is scheduled to leave Finland on Friday when it will set sail for its home port of Fort Lauderdale in the United States, where it will arrive in about two weeks. Oasis of the Seas will make its four-night maiden voyage from Fort Lauderdale to Labadee in Haiti on December 1 and there are still some places aboard the ship's first voyage to be filled. A modern day Titanic... hope it doesn't meet the same f8. It does look a little topheavy. Vladimir79 wrote: It does look a little topheavy. A 533 mm torpedo should do the job.